St. Paul, Minn., September 4, 2015 PolyMet Mining Corp. TSX: POM; NYSE MKT: PLM today reported that it has filed its financial results for the three and six months ended July 31, 2015. PolyMet controls 100 percent of the development-stage NorthMet copper-nickel-precious metals ore-body and the nearby Erie Plant, located near Hoyt Lakes in the established mining district of the Mesabi Iron Range in northeastern Minnesota. On June 22, 2015, the independent EIS Contractor circulated the preliminary final Environmental Impact Statement to the Co-lead and Cooperating Agencies for review, which has now been completed. The MDNR issued a timeline for completion of the final EIS with publication in the Federal Register and the state Environmental Quality Board Monitor in November 2015 and the states Record of Decision on EIS Adequacy in February 2016. On August 5, 2015 the EPA issued its comments on the preliminary final EIS, stating that it reflects many improvements to the project, and to the clarity and completeness of the environmental review. PolyMet received the second and third tranches, each of $8.0 million, of the $30 million secured loan facility from the Glencore AG, a wholly owned subsidiary of Glencore plc. The remaining $6.0 million is scheduled to be drawn on or before October 1, 2015. On July 30, 2015, PolyMet amended its previous financing arrangement with Glencore by extending the maturity date of the $25 million initial principal secured convertible debentures to the earlier of March 31, 2016 or receipt of permits and availability of construction finance (Early Maturity Event.) The interest rate margin was increased to 8.0% from 4.0% over 12-month US dollar LIBOR effective August 1, 2015. At the same time, the expiration date of Glencores warrants to acquire 6,458,001 shares of PolyMet was extended to the earlier of the Early Maturity Event or December 31, 2016 and the purchase price was reduced to $0.9292 per share from $1.3022. Loss for the three months ended July 31, 2015 was $1.698 million compared with $1.610 million for the prior year period. General and administrative expenses excluding non-cash stock-based compensation for the three months ended July 31, 2015 was $1.041 million compared with $0.955 million for the prior year period. Loss for the six months ended July 31, 2015 was $5.256 million compared with $3.394 million for the prior year period. General and administrative expenses excluding non-cash stock-based compensation for the six months ended July 31, 2015 were $2.258 million compared with $2.197 million for the prior year period. 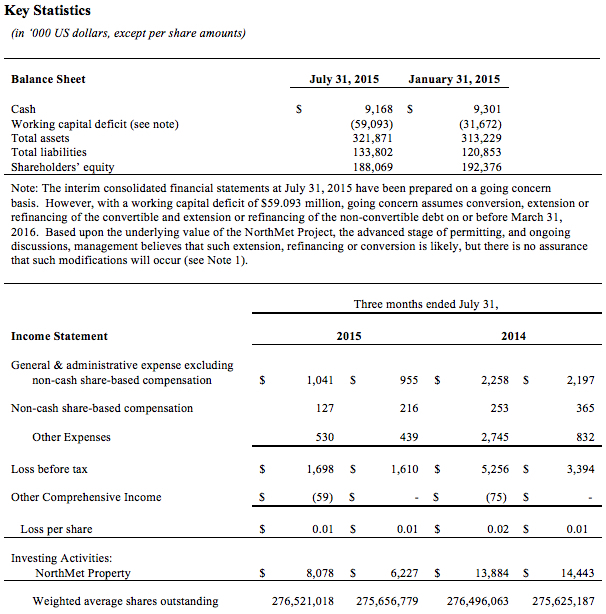 At July 31, 2015 PolyMet had cash of $9.168 million compared with $9.301 million at January 31, 2015. PolyMet invested $8.078 million into its NorthMet Project during the three months ended July 31, 2015, compared with $6.227 million in the prior year period. As of July 31, 2015 PolyMet had spent $94.8 million on environmental review and permitting, of which $88.4 million has been spent since the NorthMet Project moved from exploration to development stage. Construction finance plan including commitment of debt prior to the issuance of permits, subject to typical conditions precedent such as receipt of permits.